Owl Things First! : A Whole Half-Day and a Give Away! I can hardly wait until tomorrow when my owlets bring a brown bag to school with half of something in it. I'm still trying to decide what I will bring. Their mission is simple...Put half of something in a brown paper bag and write three clues on the bag so we can guess what it is. PARENTS: I WAS VERY CLEAR THAT THEY SHOULD ASK YOUR PERMISSION BEFORE CUTTING SOMETHING IN HALF!!! 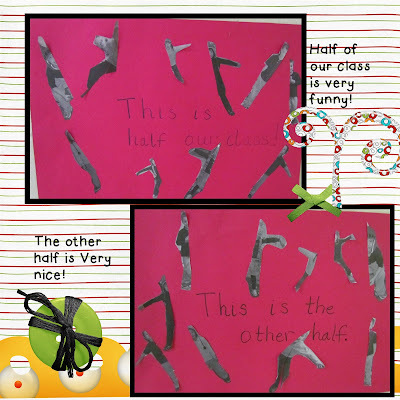 We have made it to the "Half" day of school.Eon't you think "Half-Day" should be half a day of school? It happened to fall on a whole day! We are half past first grade. It came at a perfect "time" since we were studying and practicing keeping track of time. I've added times to the daily routine so that they become more aware of times passage and they love to tell me when we run out of that precious commodity, especially if it is cutting into their lunch or snack time. In order to celebrate we spent a "whole" lot of time talking about and cutting things in half...including ourselves. You don't want to waste any more time here. 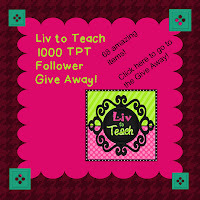 Rush over to Liv to Teach to enter her amazing Give Away. You will be amazed at half the items being given away and wowed by the other half! This is too cute! I will have to try this when we cover fractions later this Spring! That's definitely a cute idea. I love the way you spice things up! What a fun idea! It will work right into to our fraction unit. Great Idea! I will have to remember that next year!